Sublime Frequencies is honored to be releasing the third LP by the now legendary Group Doueh. 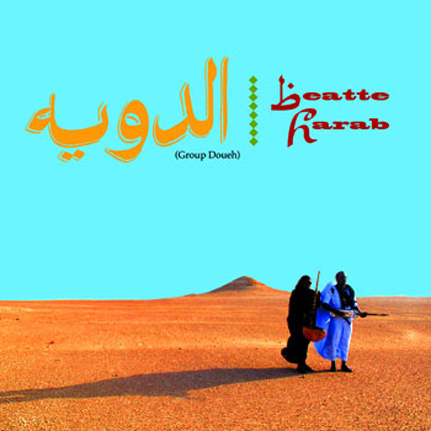 Group Doueh have been playing in and around their native Dakhla, in the Western Sahara for over 27 years. Sublime Frequencies discovery of the group, via a song heard on a radio broadcast in Morocco in 2005 and an exploratory mission in 2006 that landed Hisham Mayet in the group's compound after chasing an overland trail all the way to the Mauritanian border sealed the band's relationship with the label. A successful European tour (with label mate Omar Souleyman in 2009) ensued and western audiences were finally able to witness the power of the group's mighty live shows. Doueh's guitar heroics and wife Halima Jakani and Bashiri Touballi's soaring vocal interplay entranced all who were present. This LP showcases a different side to Group Doueh's far reaching arsenal of sounds. The songs represented on this album adhere to the roots of Saharoui music---drawing from the classical repertoire of ancestral Mauritanian musical modes. Using the traditional Moorish instruments such as the Tinidit (three string Mauritanian lute), Ardin (Kora like harp played traditionally by women), Tbal (clay drum) and the Kass (tea glasses) along with guitar and Korg synth, Group Doueh manage to attain heights of spiritual poetry that this music aspires to convey. Halima's ardin playing and most importantly her vocal prowess take this music to blissful and exalted realms. Doueh's tinidit and guitar overlays showcase the technical virtuosity and command that this master has over the region's stringed instruments. This is the music of Group Doueh's roots and the band truly takes these traditions to cosmic heights. Recorded by Group Doueh and Hisham Mayet on location in Dakhla, West Sahara in 2010. This Limited edition vinyl LP comes in a beautiful full color gatefold Jacket.